Add stylish fun to any room with our premium woven pillow personalized with your furry best friend! Our stunning Pawtraits™ are illustrated by our professional artists from a photo of your pet and the image heat transferred on to our premium burlap pillow. Ink won’t run, fade or distress and the pillow is machine washable! Just pick your favorite background, tell us your pet's name and upload a photo! Our professional artists will send you a proof within 3 business days for your review and approval. If you don't love the background you selected, no worries! We'll be happy to send you additional background options until you are 100% in love! 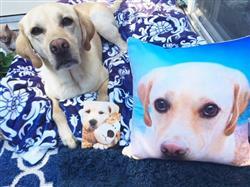 Once the proof is approved, you will have your very own Pawtrait™ Pillowat your door step within 2 short weeks! Wonderful experience from the customer service to the final product. You won’t be disappointed! I love the pillow portrat of my dog! !...I had also ordered a portrait that came out sooo good. Got the pillow on the couch and portrait hanging on the wall. Love Love Love!!!! Rachel was a delight to deal with!! And even with my requesting some changes, it got to us in time for Father's Day!!!! Great quality and experience! I ordered a pet pillow for my husband for Fathers Day. He & our dog, Eddie, are joined at the hip & my husband loved his gift!! My husband was thrilled with the pillow of our dog Stella. I gave it to him for Father's Day. It matched the portrait I had made of her that I gave him at Christmas. It was a pleasure dealing with My Pooch Face on both my orders! Thank you! !